You will be staying at Hotel Capital, conveniently located in the Lisbon modern city-centre. The location is directly connected to the airport by the subway (red line) and within a ten-minute walk of our institute. Please find the detailed directions below. By aerobus (recommended): you can buy the ticket (4.95 euros) online or at the airport. This ticket will also give discounts to several city tours and there is a bus stop very close to the hotel at Avenida da República (aerobus line 1). By subway: take the red line, from Aeroporto (first station, at the airport) to Saldanha. By taxi: if you decide to take a taxi, we recommend you buy a pre-paid taxi voucher, on sale at the arrivals in the airport, in the Lisboa Welcome Center, or online. The city centre is in zone 1 (including this hotel and the campus), so apparently it should cost around 16 euros. It should take you around 15 minutes to reach the hotel (or a bit more if there's traffic). A normal taxi ride to the hotel should cost less, but unfortunately the taxi drivers at the airport (and only there!) can sometimes be dishonest and charge you 30 or 40 euros if you do not have the voucher. For invited guests: please note that unfortunately, according to the Portuguese Science Foundation rules, we cannot refund local urban transportation expenses. By subway: take the red line as described above to reach the hotel, but get off at Alameda or Saldanha. By taxi: indicate the entrance of Instituto Superior Técnico in Av. António José de Almeida as the destination (see map below). 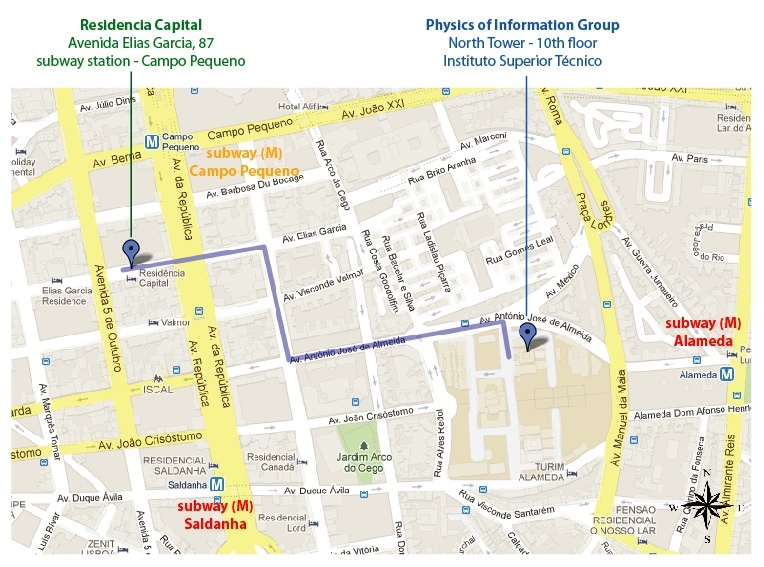 The Physics of Information and Quantum Technologies Group is located in the 10th floor of Torre Norte [North Tower], in the campus of Instituto Superior Técnico (IST). You can reach our site from Hotel Capital by walking (around ten minutes), following the blue path indicated in the map above.